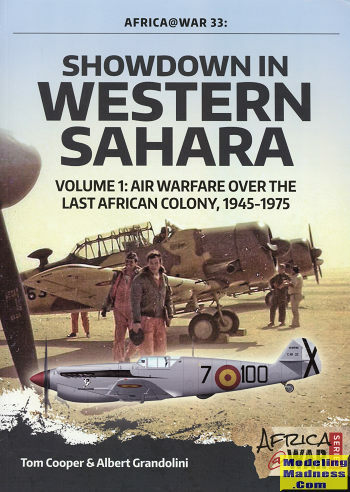 This book is #31 in Helion's Africa at War series and covers the conflict in what was Spanish Sahara from 1945 until 1975. In fact, there is still conflict in what is now Western Sahara, the largest 'country' that is still not incorporated as such, though like the Russians in Crimea, most of it has since been annexed by Morocco. After WWII, many European nations tried to keep their colonies in Africa firmly in their control, but as was soon discovered, this rarely happened. While some nations were provided independence in a relatively peaceful manner, many were not. Morocco, Algeria, Tunisia and what is now Mauritania were basically controlled by France. Parts of Morocco and Western Sahara were in the Spanish sphere of influence. This book concentrates on the Spanish portion of these areas and in particular the war in the air. It is due to air power as much as anything else that Spain was able to hold onto its territories for so long after the war. What makes it more interesting is that they did this with basically 'new' WWII German designs based on the Ju-52, He-111, and to some small extent, the Bf-109. Later on it used armed T-6s and Do-27s to a considerable extent. The entire history of the region is very convoluted and the authors not only are able to straighten things out for the reader, but provide some very good insight as to conditions of the war at the time. We get to see how the French influenced the various battles and conflicts, as well as internal issues with Morocco, which was and still is a major antagonist in the region. In fact, the rise, fall, and rise again of the Moroccan Air Force is given considerable space. Morocco had to deal with numerous coups, some of which ended up decimating the Air Force through the jailing and murder of many of its competent officers and technicians. A major plus to the book are some excellent maps, a bevy of superb photographs and several pages of full color profiles, the sorts of things that modelers and enthusiasts appreciate. It makes for not only a very well written and researched history, but a fascinating look at conflict in an area of the world most people see as little more than a footnote. Most highly recommended. Review book courtesy of Casemate Publishing, where you can order your copy at this link.